Easy as Pie | What's Cooking at the Genua's? I came across this recipe in a holiday book. (Christmas is just 168 days away you know!) It claims to be the easiest pie in the world to bake. While reading it over I would have to agree. I think even the “baking challenged” as I tend to be sometimes can bake this pie. 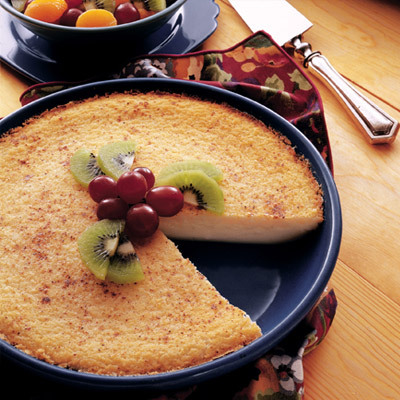 I don’t have a picture but it is a custard pie and has coconut in it. So sort of like a coconut custard pie. One of my favorites. So practice for the holidays and get baking everyone! I think I will make it myself next time I have an ‘event’ that needs a dessert! By the way it is NOT a low-calorie dessert. But that’s ok now and then! Moderation! Heck I may even make it this weekend to see if it actually works! Then I will have an actual picture to show. If anyone makes it before I do, please send me a picture and I’ll include it! I will put in a “temporary” photo until then. Pour into a 9″ deep dish pie pan.